“STAY IN YOUR LANE!” These passionate words from Robert Madu (robertmadu.com) at the Catalyst Conference echo in my mind. He gave a powerful message relevant to what I think we all struggle with…the comparison trap. We are in race. When we look in someone else’s lane, we will trip and fall because we will miss what’s right in front of us. Our races are different for a divine reason and we are all meant to keep our eyes on Jesus, not each other. This week, through an unusual mix of conversations and encounters, I have been subtly reminded of who I am not. And it feels….icky. It feels icky when we look at others and then look at ourselves in comparison and feel like we come up short. Why? Because we were not meant to define our identity on a measuring stick to other people. God in His great mercy, took away that measuring stick…our distance to perfection was so very far that He came to give us HIS greatness, to give us the full measure of perfection that is only available in Christ. The Truth about us is defined by Him. He is the Potter, and we are the pots handmade uniquely to reflect His image and glory. When we look at others pondering our identity, we see who we are not. When we look at Jesus, we see who we are. And to our Creator, who we are is very special. When I start to think about who I am not, I try to remember who I AM and what is in my lane. God has given me unique gifts. He has given me an amazing husband and made me the only person on this planet chosen to walk through life with him as one flesh. He has given me two precious children who cry out for “mama” and no one else will do. He has given me a love of writing and sharing my story. He has opened doors for me to see hurting people look to Jesus and go from dead on the inside to alive. People who the world often overlooks. Over the past four years, I have grabbed hold of where I feel God is calling me, and as a result, I have let go of some things. My lane is much less successful by worldly standards. Sometimes, when I look at others, I long to be approved by the world around me. When I look at what I don’t have, it blinds me to what is right in front of me and to HIS goodness, which is more than enough! I have been rescued from an ordinary life into an extraordinary life of unseen realities, “for the things that are seen are transient, but the things that are unseen are eternal.” (2 Corinthians 4:18) I am reminded that He is preparing for us “an eternal weight of glory beyond all comparison.” (2nd Corinthians 4:17) When I let go of my desire for approval by the world’s standards, I can make room for His perfect love and become who I am meant to be. 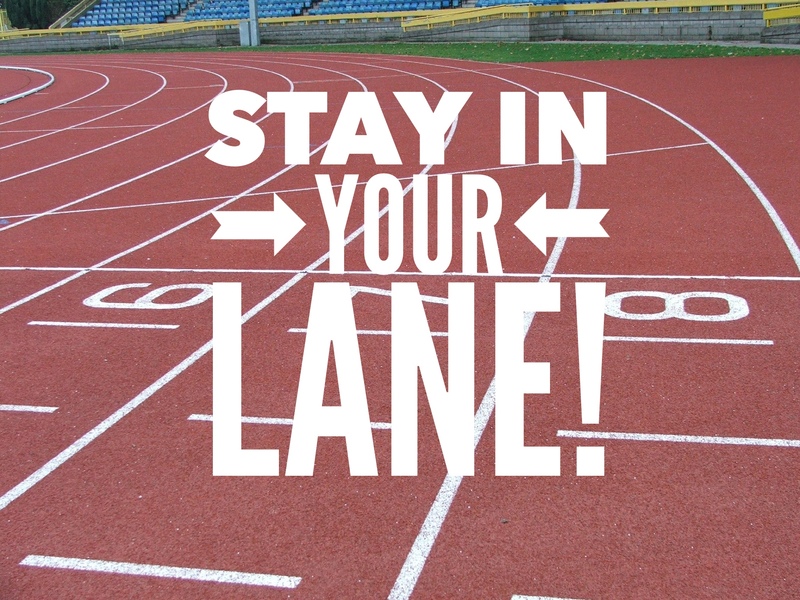 I can look in others’ lanes and stumble and fall, often in a pivotal part of my race. The comparison trap comes from all angles. Sometimes I see people running their race beautifully in something God has called them to do, and wonder if I should be doing that too. Robert Madu calls this the “but me” glasses. When we look through the “but me” glasses, evaluating things through the lens of where we fit in, we are paralyzed from genuinely celebrating Kingdom wins and giving others much needed encouragement. By looking through the lens of Christ, we can see others and their accomplishments, not in relation to us, but how He sees them. Let’s encourage someone who is running beautifully today! I think the comparison trap happens because when we think of races, we often think of competition. I think of the Olympics where there is only one gold medalist. But God’s race is not like that. In His race, we are NOT running against each other. We are running TO Jesus. We are running AGAINST spiritual powers of darkness. “For our struggle is not against flesh and blood, but against the rulers, against the authorities, against the powers of this dark world and against the spiritual forces of evil in the heavenly realms.” (Ephesians 6:12) We have a real enemy and that enemy is always spiritual. It is not someone in another lane. Not ever. They are most often the ones on our team who we should celebrate and encourage. We are running against doubt, fear, insecurities, and lies. Any long distance runner knows that the biggest obstacles in the race are in their mind. We are called to throw off the sin that so easily entangles us. I think of Forrest Gump running for the first time and the braces falling off his legs. I love the expression on his face as he realizes he is not handicapped and discovers that within him is actually something amazing. As we throw off our sin, we become like Jesus, “for those God foreknew he also predestined to be conformed to the image of his Son.” (Romans 8:29) “And we all, who with unveiled faces contemplate the Lord’s glory, are being transformed into his image with ever-increasing glory.” (2nd Corinthians 3:18) There are powers of darkness that are terrified to see this happen and want us to keep our eyes fixed anywhere but Jesus. But there’s a cloud of witnesses of those who have gone before who are surrounding us and cheering us on. Because our race matters. I want to look back and see a race well run with Him and for Him. I want to see a LOT of love and not a lot of fear. I want to see that I said YES to the things that matter to Him and no to the things that don’t. I want to see grace received and extended in abundance. I want to see that I grabbed hold of the life that is truly life, and let go of the things that so often distract me from His purpose and call. I want to be remembered by the light of Christ He so graciously put in me to shine. I want to have an eternal impact during my time here. I want to say, “I have fought the good fight, I have finished the race. I have kept the faith.” (2nd Timothy 4:7) But I can’t do that if my eyes are fixed on someone else’s lane. We are distracted by design because we were made made by design…we were created in a unique way for a unique purpose that if fully stepped into, would terrify the powers of darkness. As Christ followers, if God uses us to share the Gospel with one person whose life is transformed by Jesus, it will change eternity and possibly the course of generations forever. We have an enemy who wants to blind us to this truth by keeping our eyes on things of this world, other people and who we are not. So, who ARE you? What’s in your lane? What are your special gifts? What’s your unique purpose? What’s in front of you right now? Who’s in front of you? Who are you racing? What do you see as your destination? And what does finishing well look like? Paul says, “my only aim is to finish the race and complete the task the Lord Jesus has given me – the task of testifying to the good news of God’s grace.” (Acts 20:24) What task has He given you? Life here is so very short. Too short for comparison and condemnation. In Christ, we can throw off the shackles that hinder us and break free to run lightly as as we were divinely designed.“Those who hope in the Lord…will soar on wings like eagles; they will run and not grow weary.” (Isaiah 40:31) Lord, give us grace to run our race and remember that He who is in us and greater than He who is in the world. Thank you thank you thank you Katie!!! I am so thankful you are sharing your gift with others. I so needed this truth today and am starting my day so encouraged and challenged to not compare myself and to be reminded of the enemy’s goal of defeating me and actually trying to destroy me. I’m beyond blessed our paths crossed. Grace and peace and much love to you !!! !